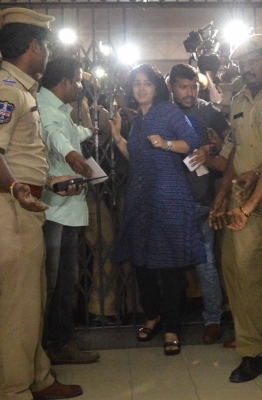 Hyderabad, July 26 (IANS) The Special Investigation Team (SIT) of Telangana’s Excise Department probing the Hyderabad drug racket on Wednesday questioned actress Charmme Kaur. The questioning began at 10 a.m. and continued till afternoon at Abkari Bhavan, the office of Prohibition and Excise Department. A four-member team of women officers led by Assistant Excise Inspector Anita questioned the actress on her alleged links with Calvin Mascrenhas, the kingpin of the racket. She was also asked whether she takes drugs. Earlier, accompanied by her lawyer and bouncers, Charmme reached the office and greeted a big contingent of photographers and videographers. 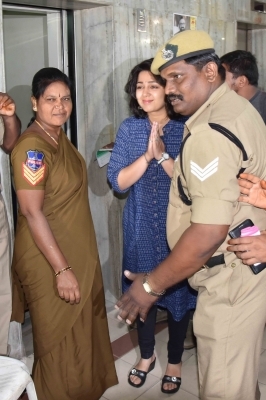 She went from the sets of “Paisa Vasool”, a movie being directed by Puri Jagannadh who was questioned in the case last week. On a petition by the actress, the Hyderabad High Court had directed that she should be questioned by women officers between 10 a.m. and 5 p.m. The officials hope to gather significant clues from Charmme, who was allegedly in touch with Calvin after the latter was introduced to her by Puri. She is the seventh celebrity from Telugu film industry to appear before the SIT. The SIT has questioned six celebrities including actors Tarun and Navdeep and director Puri Jagannadh. They were summoned after the SIT found their contact details in the call data of Calvin Mascrenhas. Actress Mumaith Khan and actor Ravi Teja are among the others to be questioned this week. The SIT has arrested 19 accused in the racket, which created a sensation following startling revelation that the peddlers sold drugs to students of several colleges and schools in Hyderabad, Tollywood celebrities and techies. The case took a new turn on Monday when the SIT arrested the manager of leading actress Kajal Aggarwal. Puttkar Ronson Joseph alias Ronnie was arrested from his house here. Narcotic substances were recovered from his possession. The actress expressed shock over the involvement of her manager in the illegal activity.